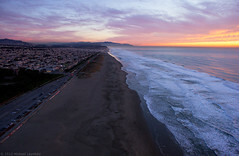 Winter sunset, Ocean Beach, a photo by Michael Layefsky on Flickr. Taken on a gorgeous early January evening from a position just across the Great Highway from Golden Gate Park. Taken by a camera lofted by a helium balloon.